JACKSON, MISSISSIPPI., — A 3-year-old girl was asked to leave a KFC allegedly because her face was scaring other customers. You may ask yourself, how could a little girl’s face scare customers away? 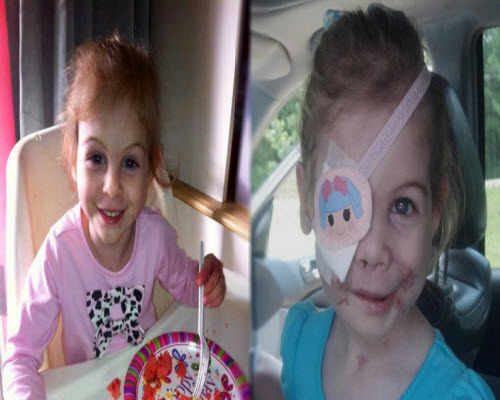 Victoria Wilcher,3, was attacked by a pit bull at her grandfather’s home in Simpson County. The attack left her faced extremely scarred and partially paralyzed. Victoria’s grandmother says when they go out, she doesn’t even want to be seen because she’s embarrassed about what she looks like. Victoria is said to be on antibiotics and still has more surgeries scheduled during her rehabilitation.